Tickets and compensation were provided by Dolby Cinema at AMC Prime. All thoughts and opinions are my own. There’s nothing like fresh movie theater scent. We had the good fortune to take the new Dolby Cinema at AMC Prime in Town Square for a test drive, and we were thrilled by the attention to detail that they put into the movie going experience. 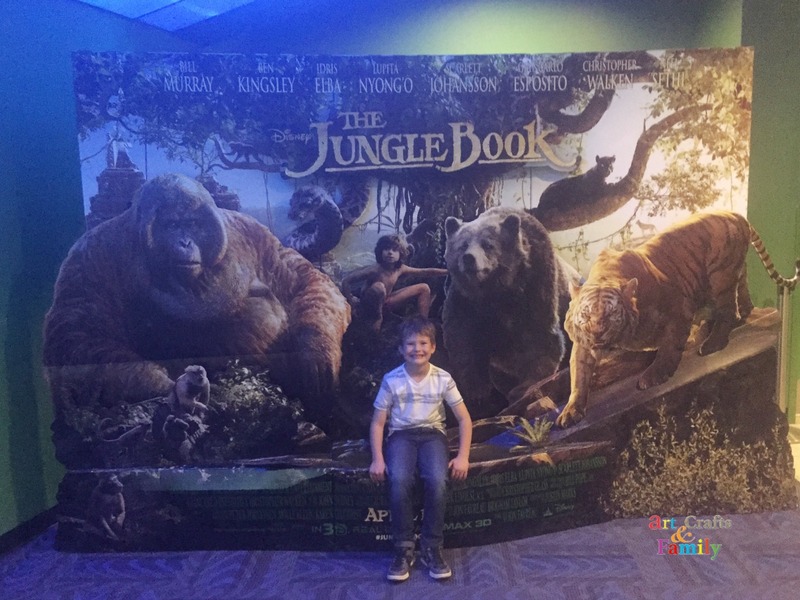 Disney’s The Jungle Book is currently playing and our little guy has been so excited to see it so when they asked us for a review it was the right time for the perfect place. From the moment you enter the theater you notice the care and craftsmanship that has gone into the construction of this amazing venue. Gone are the dimly lit running lights and the claustrophobic hallway that leads you to your seat. The hallway has been widened and one wall has been replaced with a HD screen that was taller than my 6 foot 3 inch frame. A video of The Jungle Book was playing on the screen and it served to get us extra hyped for what we were about to see. When you enter the theater itself I was immediately struck by the size of the screen. Huge, the screen encompasses your entire field of vision. Next we found our seats. The seats were so luxurious, they fully recline at the push of a button and the cushions are so soft and comfy. Additionally you can be fully reclined in your chair and if someone needs to get down the aisle there is plenty of room for him or her to do so. That is what is so impressive about this theater it is the space you have. Everything is bigger, the screen, your seat, the aisles, and the sound is huge. You would expect great sound from a Dolby theater and this is some of the best I have heard. I turned around in my chair several times thinking Shere Khan was sneaking up on us. The picture quality was equally impressive with tremendous clarity and resolution. The picture and sound in the Dolby Theater give you the feeling that you are right there in the middle of the jungle. THE JUNGLE BOOK – (Pictured) MOWGLI and BALOO. ©2015 Disney Enterprises, Inc. All Rights Reserved. The Jungle Book was amazing and definitely added to the experience. I feel it was the perfect update to the classic animated feature. All the elements that people love about Disney were present in the film. We laughed, we cried, were scared at times and thrilled at times as Mowgli makes his transformative journey through the jungle. THE JUNGLE BOOK – (L-R) MOWGLI and BAGHEERA. ©2015 Disney Enterprises, Inc. All Rights Reserved. This film definitely has more action than its predecessor; our little guy loved what he called, “all the jump scares.” There is music in the movie as well although it does not play as big a role as it did in the first. This movie going experience is the complete package and perfect for the entire family. There is something for everyone young and old alike. The Jungle Book is in theaters now! See it today in Dolby Cinema at AMC Prime! Here is a listing of all participating Dolby Cinema at AMC Prime locations. This movie looks amazing – I love how they did it all and can’t wait to take my kids!